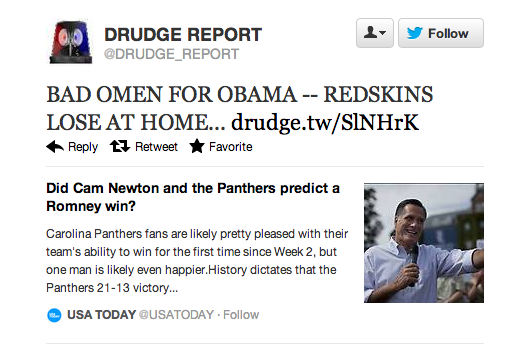 Did Cam Newton and the Panthers predict a Romney Win? : In the 18 presidential elections that have taken place since the Redskins moved to Washington in 1937, 17 have been predicted by the team's performance in its final home game prior to the election. If the Redskins win at home, the incumbent party usually wins the presidential election. If the Redskins lose at home, the challenger usually prevails. So, what do you do when the the actual odds and polling averages aren't in your favor? You turn to omens and auspices of course. I predict we see televised extispicy before all the votes are tallied Tuesday evening/Wednesday morning.